Bay Area Counties took in more than $6.5 million from jail phone calls last year, which can cost nearly $9 for a 15 minute conversation. Families of county jail inmates across California are striking back against what they call “unfair and excessive” phone fees that send vulnerable families into debt and limit communication between loved ones. At least nine California counties have been hit with class action lawsuits this year claiming jails “extort” mostly poor and minority families that are trying to stay in contact with incarcerated family members. For a boy or girl speaking with their father or a wife calling her husband, those fees can be cost prohibitive. In parts of the Bay Area, families can spend more than $30 for a one hour conversation. With these families in mind, the Federal Communications Commission voted 3-2 earlier this year to limit what prisons and jails can charge for in-state phone calls, but a federal court blocked that fee cap. Families and their attorneys are now waging that fight one county at a time throughout the state. They realize there isn’t an abundance of public sympathy for inmates, but they ask the public to consider the toll those fees take on families, and what it’s like for a child to grow up without a relationship with their mother or father. Banks, a plaintiff in one of those lawsuits, spent more than 30 years working for Hewlett Packard.She met her husband Alfred later in life, after retiring from her career. They bonded through a church program to feed the hungry and were soon married.Just days after they were married, Alfred began his sentence. She’s only allowed to visit twice a week, so Banks cherishes the time they spend on the phone. They speak at least twice a day unless they’re interrupted by a lockdown or some other disturbance at the jail. But those conversations come at a price. Every month, Banks pays hundreds of dollars in fees to a private company contracted by the county to provide jail phone services. Each 15 minute call costs more than $4, and by the end of the month, her budget is stretched thin. To avoid going into debt, Banks came out of retirement, taking a part time job working the cash register at a local Walmart. The cost of a phone call from a Bay Area jail varies by county, but they’re all significantly more expensive than calls made from a California State Prison. That’s because California dramatically reduced the price of in-state phone calls from its state prisons in 2011, limiting the cost of a 15 minute conversation to less than $1.50. But phone contracts obtained by the Investigative Unit show calling from a Bay Area county jail can cost nearly six times higher. In Napa County, which charges the highest fees in the region, the cost of that same 15 minute call can cost nearly nine dollars. Even in San Francisco, which has the cheapest rates in the Bay Area, families pay more than $2.60 for 15 minutes on the phone. Those fees mean big money for Bay Area counties, which raked in more than $6.5 million last year. Alameda County alone generated more than $2.2 million in revenue. But proponents of those fees say the money goes to a good cause. California law mandates that the revenue is placed in an inmate welfare fund to pay for things like educational and religious services. Although all nine Bay Area counties declined to be interviewed for this story, some said these funds would dry up if fees were slashed. But critics of the fees, including FCC Commissioner Mignon Clyburn, argue these programs can still be maintained without placing thefinancial burden on vulnerable families. Inmates typically don’t have many advocates in their corner, but on this issue, they have a powerful champion in Clyburn. According to Clyburn, who ranked this issue among the most important facing the FCC, families pay an average of $5,000 each year to keep in touch with incarcerated love ones. 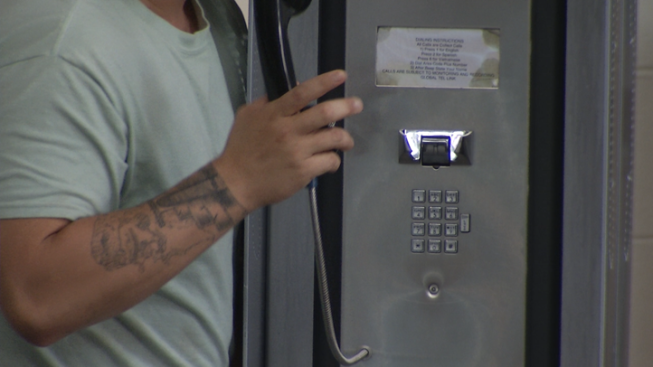 Studies (LINK) show that one in three families will go into debt paying for jail phone calls. Clyburn said she was devastated when a federal court blocked the FCC’s approved fee cap, but vows to keep fighting. Reform advocates like Clyburn also argue that lower phone rates are beneficial for society as a whole. Jail can be a revolving door for many inmates, but studies show family contact reduces recidivism when they return to society. Darris Young, who served 17 years in prison, knows this firsthand. Young now works with the Ella Baker Center for Human Rights in Oakland as a local organizer. He spends a lot of time doing outreach work at local jails, and speaks routinely speaks to the families of inmates. He said counties should consider those families when setting phone rates. Despite having to put retirement on hold, Banks said she’ll keep paying for those phone calls. It’s an investment in her relationship, after all. And one day soon, she can speak to her husband for as long as she wants with no guards and nobody else listening. At least nine California counties have been hit with class action lawsuits this year claiming jails “extort” mostly poor and minority families that are trying to stay in contact with incarcerated family members. For a boy or girl speaking with their father or a wife calling her husband, those fees can be cost prohibitive. In parts of the Bay Area, families can spend more than $30 for a one-hour conversation. With those families in mind, the Federal Communications Commission voted 3-2 earlier this year to limit what prisons and jails can charge for in-state phone calls, but a federal court blocked that fee cap. Families and their attorneys are now waging that fight one county at a time throughout the state. They realize there isn’t an abundance of public sympathy for inmates, but they ask the public to consider the toll those fees take on families and what it’s like for a child to grow up without a relationship with their mother or father. Banks, a plaintiff in one of those lawsuits, spent more than 30 years working for Hewlett Packard. She met her husband Alfred later in life, after retiring from her career. 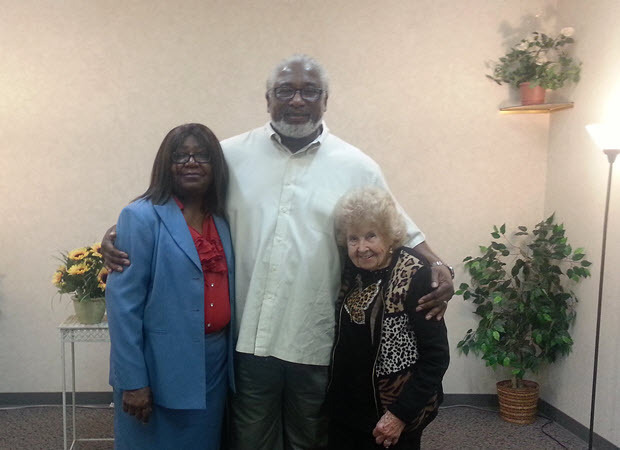 They bonded through a church program to feed the hungry and were soon married. Just days after they were married, Alfred began serving his sentence. Shirley Banks and her husband. The cost of a phone call from a Bay Area jail varies by county, but they’re all significantly more expensive than calls made from a California state prison. That’s because California dramatically reduced the price of in-state phone calls from its state prisons in 2011, limiting the cost of a 15-minute conversation to less than $1.50. But phone contracts obtained by the Investigative Unit show calling from a Bay Area county jail can cost nearly six times higher. In Napa County, which charges the highest fees in the region, the cost of that same 15-minute call can cost nearly $9. Even in San Francisco, which has the cheapest rates in the Bay Area, families pay more than $2.60 for 15 minutes on the phone. Those fees mean big money for Bay Area counties, which raked in more than $6.5 million last year. Alameda County alone generated nearly $2.2 million in revenue. But proponents of those fees say the money goes to a good cause. California law mandates that the revenue is placed in an inmate welfare fund to pay for things like educational and religious services. Although all nine Bay Area counties declined to be interviewed for this story, some said these funds would dry up if fees were slashed. 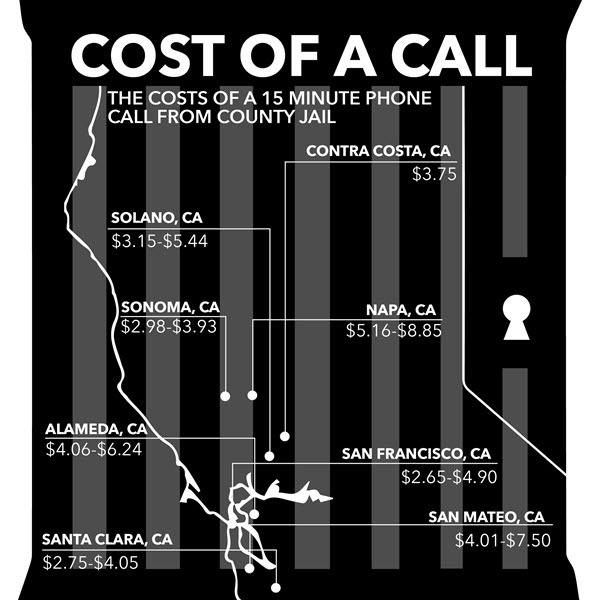 Infographic on the average cost of a 15-minute phone call from county jail. But critics of the fees, including FCC Commissioner Mignon Clyburn, argue these programs can still be maintained without placing the financial burden on vulnerable families. Inmates typically don’t have many advocates in their corner, but on this issue, they have a powerful champion in Clyburn. According to Clyburn, who ranked this issue among the most important facing the FCC, families pay an average of $5,000 each year to keep in touch with incarcerated love ones. Studies show that one in three families will go into debt paying for jail phone calls. Clyburn said she was devastated when a federal court blocked the FCC’s approved fee cap, but vows to keep fighting. Young now works with the Ella Baker Center for Human Rights in Oakland as a local organizer. He spends a lot of time doing outreach work at local jails and speaks routinely speaks to the families of inmates. He said counties should consider those families when setting phone rates.